Very Early Warning Fire Detection is a major element of disaster risk reduction. It prevents loss of life and reduces the economic and material impact of disasters. To be effective, Early Warning Systems need to actively involve the individuals at risk, facilitate staff education and awareness of risks, effectively disseminate messages and warnings and ensure there is a constant state of preparedness. This article aims to present the basic elements, actions and good practices associated with effective Early Warning Systems. It supports the development and implementation of Early Warning Fire Detection Systems that are people centred and whose warnings are timely and understandable to those at risk, including guidance on how to act upon warnings. Please also find a video on Very Early Warning Fire Detection which supports this article. Key Actors: Early Warning Systems are people centred. While property protection and business continuity goals are largely based on the owner, timely and decisive response to an incident is driven by skilled staff on duty. Risk scenarios are constructed and reviewed. Operational procedures such as evacuations and firefighting are practiced and tested. Fire Detection Technologies: Designing to typical code requirements will not necessarily meet property protection and business continuity goals. Performance-based designs that consider fire ignition scenarios and design for these scenarios, rather than simply meeting the code compliance, address these goals. Enhanced detection sensitivity is crucial for a timely response as are multiple warning levels for proper escalation. Developing and implementing an effective Early Warning System requires the contribution of a diverse range of individuals, organisational units and groups with different functions and responsibilities. The risk of a company having to close permanently after a fire disaster makes business continuity planning critical. This includes drafting a prevention plan, making preparations for an impact, calculating the incident response time and looking into how the company can restore operations following a disruption. For a data centre for example it is important that the operational teams are aware of potential problems before the customers notice them. With effective monitoring based on early warnings, problems can be fixed before they escalate. Knowing about potential threats and being able to detect and act upon them in a timely manner will substantially reduce the financial risks involved. Timely deliveries, prompt customer support and uninterrupted data processing are the merits of an Early Warning System. Organisations need continuous access to their network and computer infrastructure and even a brief interruption to critical business processes can have devastating effects on revenue streams and customer confidence. Therefore, for many businesses, best possible fire protection is imperative. Many of these businesses are even interdependent: Todays economies are heavily driven by information technology controlling resource planning, production, order processing, transaction and logistics cross continents and at high speed. Consultants, specifiers and engineers have a critical role in providing specialised technical input to assist in developing Early Warning Systems. Their expertise is central to analysing risks, supporting the design of monitoring and warning services, supporting data exchange and to the dissemination of understandable warnings to those at risk. The AHJ play a crucial role in ensuring fire/life safety in buildings. It is essential that owners and fire officers of a building understand the role of the AHJ. The AHJ are usually involved in the plan review process. This helps ensure that the building and its related systems meet the requirements of the adopted code. In other words: The AHJ are checking those parts of the building which need to be “code compliant”. It is therefore important to understand the code requirements and to seek an understanding with the AHJ regarding the code coverage of an Early Warning System. The objective of Early Warning Systems is to empower individuals threatened by hazards to act in sufficient time and in an appropriate manner to reduce the possibility of personal injury, loss of life and damage to property and the environment. 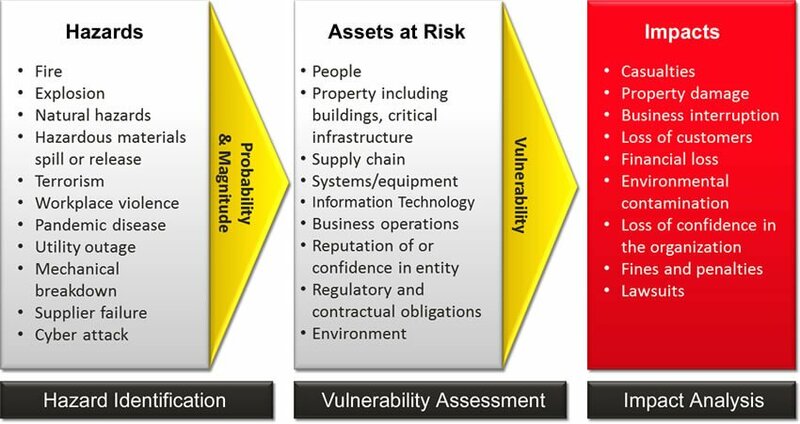 A complete Early Warning System comprises four interrelated elements, spanning from knowledge of hazards and vulnerabilities to preparedness and capacity to respond. Best practice Early Warning has strong interlinkages and effective communication channels between all of the elements. Fire risks arise from the combination of hazards and vulnerabilities at a particular location. While a data centre’s vulnerability may lay in the potential corrosion of circuit boards due to the contamination with combustion by-products generated by overheated wires, a power plant’s dominant risk might be the vulnerability of transmission elements such as switch gears and transformers. Whatever the application might be, it is important to analyse, identify and properly assess all hazards and vulnerabilities of a site. Risk assessments and maps are the base to prioritise Early Warning System needs and guide preparation for disaster prevention, proper incident detection and response. Warning services lie at the core of the system. Continuous monitoring of hazard parameters such as smoke, heat or gases at an elevated level of sensitivity is essential to generate accurate and timely warnings. Detectors for different hazards are to be coordinated by suitable processing of the information by the fire alarm control panel. There are numerous detection approaches available to provide Early Warning of a fire. The inherent criticality and essential nature of a particular industry will often dictate the detection approach. Detection strategies typically include spot-type smoke, heat or gas detectors, air-aspirating detectors, linear heat detectors or a combination thereof. A proper risk assessment with clearly defined stakeholder goals help to guide the detection design. detectors are inaccessible to maintenance personnel for periodical testing due to restricted access. overcome access issues by providing easily accessible test points. Especially the first two abilities are of importance for Early Warning Systems. High sensitivity usually translates into earlier detection while multiple warning levels may deliver the triggers for responding in an adequate manner. The video sequence provides clear evidence of the detection qualities of air-aspirating systems for the first four abilities. Even though the aspirating tubes are mounted on the ceiling and the high airflow (due to conventional cooling with outside air), the detection abilities are quite remarkable. Warnings must reach those at risk as well as those on duty to respond. Clear messages containing simple, useful information are critical to enable proper response. The necessity for multiple communication channels needs to be assessed to avoid failure of any one channel and to reinforce the message. 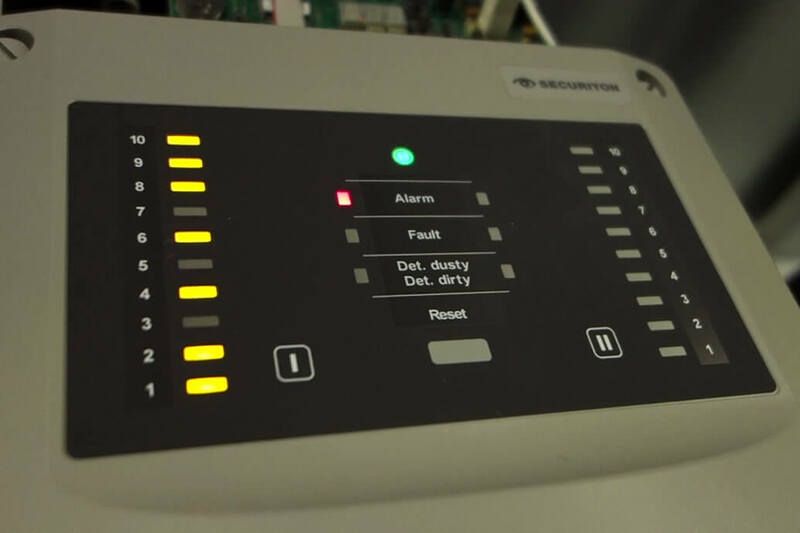 Early Warning Fire Detection Systems are offering warnings at different sensitivity levels of the detection. Each of the so-called Pre-Alarms is calling for a specific set of actions. Typically, the very first of this set of Early Warnings is requesting the fire officer on duty to verify the indicated condition and, if confirmed, to try to locate, isolate and eliminate the source of trouble. Only at a higher stage of warning he will be asked to take precautionary measures such as issuing the fire alarm to the building, evacuate the scene, call the emergency team or initiate extinguishing. It is essential that responsible individuals understand the risk, respect the warning and know how to react. Training and preparedness play a key role. Disaster management plans need to be in place, well-practiced and tested. The individuals at risk should be well informed about options for safe behaviour, available evacuation routes, and how to best avoid damage and loss of property. The challenges in disaster management are characterised by incomplete pictures of the current situation, ad-hoc decision taking, and general unpredictability. Disaster Management Software deals with supporting staff in emergency situations by providing relevant information, facilitating task and resource allocation, and managing communication with all involved parties. Properly implemented and exercised, it helps to handle the typical information overload and taking sound decisions in a stressful situation. You may identify all risk statements given in NFPA 75, NFPA 76 and FM 5-32 and list them under the headline “Risk Assessment”. Subsequently, you may do the same for the other categories “Monitoring & Warning”, “Dissemination & Communication” and finally “Response”. Finally, you may fill in all other relevant information found in fire statistics. The result is a crisp clear picture on all criteria to be addressed when deciding on the design approach (performance-based vs. prescriptive) or discussing with the AHJ, the engineering party or the data centre management.